Keen to get the Rs 1,000-crore development project fund for the promotion of carbon neutrality at the earliest, the state government today held talks with a high-level delegation from the World Bank (Washington) visiting the state to oversee the preparedness of the hill state in implementing the first-of-its-kind project in the country. The Public Works Department’s (PWD) role in the construction of three blocks of Jawaharlal Nehru Engineering College here has come under the scanner. The state Agriculture Department will soon be constructing check dams to store about 9 crore litres of water in Hamirpur district. The Tourism and Civil Aviation Department will prepare a Mega Rural Tourism Circuit at the cost of Rs 50 crore for promoting rural tourism and generating employment avenues for local youth. A 45-year-old man from Jaisinghpur died at the DRPGMC Tanda Tuesday night following the consumption of poison at his residence by mistake, the police said here on Wednesday. An accused in a tractor scandal case, in which 15 tractors went missing, surrendered before officials of the special investigation team (SIT) in the police station here recently. Taking a grim view of the unscientific and illegal mining of limestone going on in various parts of Paonta Sahib, General Manager, District Industries Centre, GS Chauhan, yesterday asserted the need to address the root cause of the issue. Having received temporary relief from rain and snow, most parts of the state are likely to be under a severe cold spell from January 31 as the town remained engulfed in thick fog today. Himachal Civil Supplies and Consumer Affairs Minister Ramesh Dhwala has honoured a number of Bilaspur district personalities who have excelled in various fields at the state, national and international levels. Accusing the BJP regime of making a propaganda on the issue of cement prices, the CPM has said the cement companies have not reduced the cost per bag by Rs 25 as is being claimed by the government. The BJP today refuted Congress charges of fiscal mismanagement, terming it as a politically motivated statement aimed at painting a wrong picture. After getting seven-day special training here, the eight-member state-level team of participants of the All-India Inter-university Weight-lifting championship left for Amritsar today. The staff deployed by a private contractor to collect toll tax on the interstate border on the National Highway No. 21 (Chandigarh-Manali) at Gara Mour have not only been misbehaving and manhandling motorists, but also leaving a bad impression on tourists for the past few years. Dr Kuldip Singh (46), a surgeon of Badoa village, near here, was declared brought dead by doctors at the local Regional Hospital where he was rushed from his home village where he had come on leave earlier. A 17-member team from World Bank (WB), headed by Charles Cormia, today held a series of talks with various departments before it released the first instalment of about Rs 500 crore. The second loan instalment of the equal amount is expected to be funded through the Climate Investment Fund of the WB with its main donors being the USA, European Union and Japan. The team held talks at length about the prior action that needs to be taken by the state government in areas like environment, hydro-power generation, industries, forest, tourism and community advocacy and awareness. Some of the initiatives in this regard have already been put in place while others are in the process of being set up. “We are keen to get the development project loan at the earliest so that we can promote carbon neutrality and as such we are trying to fulfil all the requirements and satisfy the WB team with whom we have had several round of fruitful meetings,” said Sudipto Roy, Additional Chief Secretary, Forest and Environment. He hoped that the loan money would be released by mid-year after the completion of formalities. The major initiatives that need to be taken include preparing a green house gas inventory that can lead to the reduction in carbon intensity with no reduction in forest cover and offsetting green house gas emissions from industry. “We are also deliberating upon the issue of placing the polluting and carbon intensive industries in the negative list along with disincentives,” said Roy. Another key area of hydro-power generation, that is one of the biggest strengths of the state, was also taken up. In this area, the cumulative impact assessment study of all the major five river basins would be undertaken along with the catchment area treatment plan for the Sutlej. The issue of proper verification of minimum 15 per cent discharge on all the rivers where projects have been set up was also discussed. Another important aspect of the programme would be empowering local communities and stakeholders to promote integrated watershed management as an instrument for rural poverty alleviation. Under this 79 integrated micro watershed development plans would be adopted along with crop diversification. The programme also calls for the promotion of environmentally sustainable tourism and preparation of an integrated master plan. 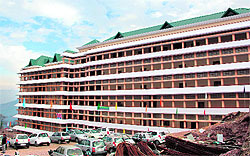 The Public Works Department’s (PWD) role in the construction of three blocks of Jawaharlal Nehru Engineering College here has come under the scanner as the department has not recovered Rs 5.17 crore from Vyom Infrastructure Ltd nor has it lodged an FIR against the firm despite the fact that the contractor had absconded in 2008 and the department rescinded the work on February 2, 2009. The role of the PWD in allotting the contract has raised questions about “how the department had allotted tender to a firm whose antecedents in the construction work are not established and whose whereabouts were shrouded in mystery”, commented insiders. The PWD had allotted the work to Vyom Infrastructure Ltd, who started work on the engineering college project on February 2, 2006, and the firm was to complete the same in the first phase within a year. The total cost of the project that encompassed a plinth area of 29,720 sq m was estimated at Rs 37.15 crore. Because of the casual attitude of the PWD, students and their parents and teaching faculty suffered all these years as the college buildings could not be readied as per scheduled in 2009. The cost of the college project shot up from Rs 37.15 crore in 2006 to Rs 107.4 crore as per the PWD’s revised estimate and the project has been delayed by almost three years. The PWD’s casual attitude is understandable as it had not finalised the drawings and plinth areas when the work was assigned to the first contractor. According to documents available with The Tribune, the contractor started work as scheduled, but failed to adhere to the deadline and he had absconded and the PWD had paid him in excess of Rs 9 crore. All show-cause notices served on him by the PWD over the years came back unaccepted as his Delhi and Chandigarh addresses turned out to be fake ones, said Lekh Ram Mehla, Superintending Engineer, PWD. “We have imposed Rs 67.27 lakh penalty on the firm on June 13, 2008, and rescinded the contract on February 2, 2009,” Mehla said. Later, the PWD issued a re-tender to Himachal-based contractors and the work on the project resumed in November 2009. They finally completed the work on three blocks of the engineering college inaugurated by Chief Minister PK Dhumal on January 25 on Statehood Day. He said the PWD had put up the case before an arbitrator at Solan as the department had sought recovery worth Rs 5.17 crore from the firm. “We will lodge an FIR soon as his addresses remain untraced,” Mehla added. Chief Minister PK Dhumal stated this while addressing a gathering during an annual prize distribution function at Government Senior Secondary School, Mair, today. He said: “The overall development of the state was being ensured by strengthening the basic network and several projects had been launched in the agriculture sector to strengthen the economy of farmers, besides creating employment opportunities in this sector.” The Chief Minister announced Rs 10 lakh for construction of an examination hall in the school and Rs 5,000 for promotion of cultural activities. Later, he distributed prizes among students. Students presented a cultural programme on the occasion. The Chief Minister also attended a few other functions during the day. Education Minister ID Dhiman also spoke. Hamirpur MP Anurag Thakur and other dignitaries were among those present. Stating this here today, Director, Tourism, Arun Sharma said a Solid Waste Management Circuit to provide civic amenities to tourists was also under consideration. He chaired a meeting to review the infrastructure development works sanctioned under the Circuits and Destination Schemes here today. Sharma directed the officers concerned to inspect tourism units and ensure proper hygiene facilities to tourists and complete works within the stipulated time. Stating this, SDPO, Kangra, Dinesh Kumar said the accused was identified as Kul Bushan, alias Lucky, a resident of Baijnath. He said Kul Bushan was wanted in a case registered against him at the Nagrotra Bagwan police station on January 18. He said 10 persons had lodged a complaint that Kul Bushan offered them a monthly rent for their tractors. They accepted the offer and 10 tractors from Nagrota Bagwan and five from other areas were taken by him on a monthly-rent basis a year ago. The SDPO said for a few months the tractor owners received the monthly rent regularly, but later it was stopped. He said the tractor owners alleged that all 15 tractors were missing. When they reported the matter to the police, Kul Bushan went underground. The SIT had started interrogating Kul Bushan, the SDPO said. The General Manager directed investors to desist from purchasing limestone from illegal mines. Addressing a meeting of investors, including the Sirmaur Mine Owners Association, at Paonta Sahib, he asserted that any investor found purchasing limestone from illegal operators would be dealt with sternly in accordance to the provisions of various laws, including the IPC, the revenue laws, the Minor Mineral Act and the Forest Act. He directed investors to exhaust whatever stock they had purchased from such mines within the next two-three days following which stern action, including sealing the units who indulged in illegal purchases, would be initiated. With Bhatrog, Dhigali and Amboa being the major areas affected by illegal mining, the measure will help check loss of revenue to the state exchequer. Chauhan said in order to make limestone available, the department would take up the issue of issuing short term permits that would besides ensuring scientific mining ensure revenue generation to the state. RP Tiwari, member, Sirmaur Mine Owners Association, while welcoming this step said since illegal mining caused loss not only to lease holders but also to the state exchequer, the association was ready to check the same and assist the department in this regard. With nearly 118 units limestone-based units in the area, illegal mining was a major issue of concern. JR Bansal, an investor, while appreciating the step said it would provide a level playing field as those purchasing illegal limestone managed to get an undue cost benefit that adversely affected cost economics. The minimum temperature in the state capital, which had started increasing slightly over the past two days, was recorded at 0.5°C, making everyone shiver. With the Western Disturbance placed over the northern part of Jammu and Kashmir, there can be rain and snow in the mid and high hills from January 31 onwards. The minimum temperature at various places in the town was Shimla -0.5°C, Sundernagar 2.3°C, Bhuntar 1.7°C, Kalpa -5.6°C, Dharamsala 4.5°C, Una 3.4°C, Mandi 6.6°C, Nahan 4.9°C, Keylong -11.6°C, Palampur 2.5°C, Solan -0.2°C and Manali -2.2°C. 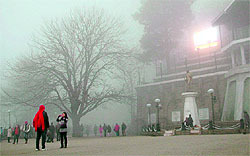 Both locals and tourists could be seen wrapped in warm clothing as cold wave conditions are once again setting in. Priyanka Negi of SAI Sport Hostel here who won a gold medal at the South Asian Games in Sri Lanka and Ritu Negi of the same hostel and captain of the Indian Junior Kabaddi team who won a gold medal at the Asian Games were honoured by the minister at a district-level Republic Day function here on Thursday. Others who were honoured by the minister included Sanjiv Kumar of the HP police who won a gold medal in the Indian National Police Games and a silver medal in the International Police meet. Government Senior Secondary School, Daslehada, student Rishabh Soni was honoured for standing first in the arts group in the state and Astha Thakur of Government Senior Secondary Girls School, Bilaspur, for Plus I science group and Anupama of Plus I of the same school were also honoured. The minister also honoured those who had saved several lives immediately after the bus accident at Bandla a few months ago. They included village women who had risked their own lives to save others who were trapped in bushes in a very steep chasm. They were Pooja Devi, Champa Devi, Shankari Devi and Ramesh Chand of Nihal village. Pharmacist Rajendra of the Regional Hospital here and driver Hem Raj of 108 Emergency Ambulance unit were also honoured for being extraordinary helpful during this accident. Present of occasion were Deputy Commissioner Ritesh Chauhan and Superintendent of Police Santosh Patial and alarge number of district officers and citizens. In a statement issued here recently, Sanjay Chauhan, secretary, Shimla District Committee, said prices had been reduced by the companies only by Rs 10 and not Rs 25 per bag as was being claimed by the government. “Reality is totally different as cement is still selling at the rate of Rs 325 to 345 per bag in the state and there has been only a reduction of Rs 10 per bag, contrary to the claims of the Chief Minister and his Cabinet colleagues,” he said. He said it was highly regrettable that the BJP regime was allowing the cement companies to loot people of the state, which reflected its pro-corporate and anti-people face. In a statement issued here today, Horticulture Minister Narender Bragta said the statement by Congress chief Kaul Singh Thakur was totally misleading and contrary to facts. “During the past four years, the BJP regime has given financial benefits worth Rs 5,300 crore to employees despite financial constraints,” he said. He said the Congress must not forget that the loan liability of Rs 21,241 crore during the Congress regime, which was 63 per cent of the GDP, had come down to 48 per cent last year due to the bale financial management of the state government. The “unruly” staff of contractor KD Sharma, whom the state government has allotted the contract for collecting toll tax, have allegedly been indulging in scuffles with tourists. Arguments and even scuffles by the toll staff with tourists have gradually started casting an adverse affect on the tourism sector. Sources in the police said the toll staff had manhandled a group of tourists and smashed windowpanes of their vehicle in a dispute over the toll receipt at the toll barrier two months ago. “The staff can often be seen having heated arguments with travellers here,” claimed Neeraj Gupta, a local resident. 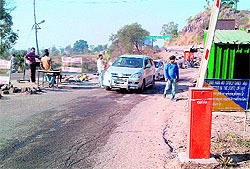 Sandeep Moudgil, a Sundernagar resident, said when he was on his way back from Chandigarh to his native place last month, toll employees at this particular toll barrier misbehaved with him. His fault was that he did not had change amounting to Rs 30 to pay them and had handed over a currency note of Rs 1,000 to the staff. AN Suman, a Delhi-based resident, said: “The behaviour of the toll staff right at the entry point of Himachal Pradesh has been discouraging tourists in a big way. The government instead of giving the job to a well-connected person, should recruit permanent government local employees.”. A visit by the Tribune team to the spot revealed that contractor KD Sharma had deployed a battery of armed men at the barrier. They use to intervene whenever there was any argument between tourists and their colleagues. Deputy Commissioner, Bilaspur, Ritesh Chauhan, claimed that the government had allocated the job to a private contractor on certain terms and conditions. If the contractor or his men violated the norms by misbehaving with tourists or indulging in acts that tarnished the image of the state, they would be strictly dealt with, he said. “The contractor can be panelised for his unlawful acts if anyone complains to the district administration against him. The complaints can directly be made to the Assistant Excise and Taxation Commissioner, Bilaspur, in this context or to the DC at dc-bil-hp@nic.in,” Chauhan added.